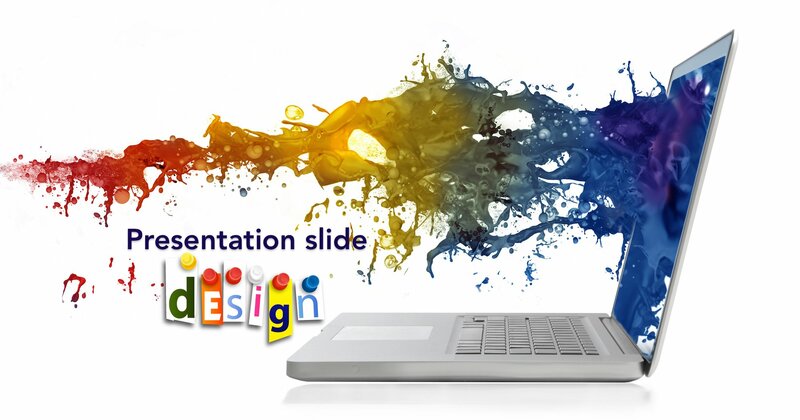 Image selection in slide design is about more than just typing the word or concept into Google or a stock photo site. It is about clarifying your message and making each slide count. Could a member of your audience flip through your slide deck after the presentation and be reminded of the key elements (audience take-away) of your presentation, without having to read all your notes? They say a picture is worth a thousand words, but using the wrong picture can be distracting and create confusion. 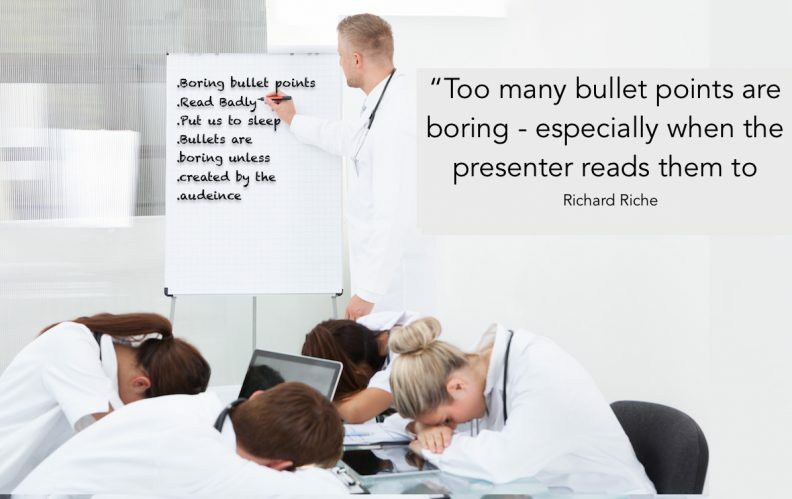 Too many bullet points are boring – especially when the presenter reads them to you. It is essential to select your words and images with care. Each word or image should augment and support your message. 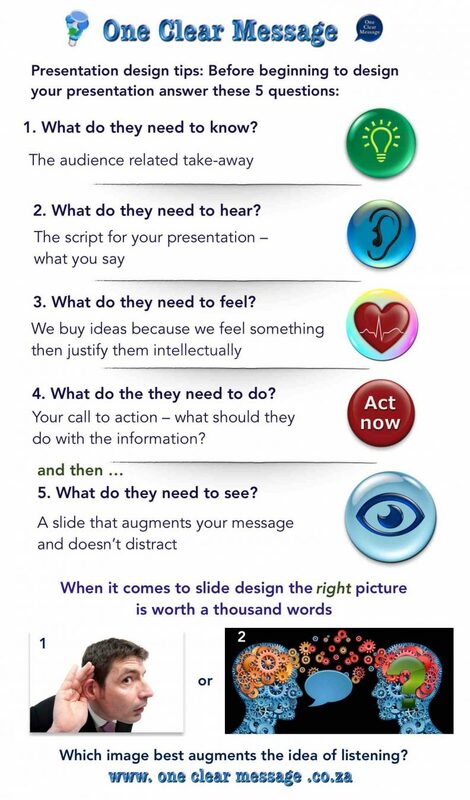 Once you have the answers to these questions clearly in your mind then you can start building powerful slides that engage your audience and make your message memorable. For example, if you are doing a presentation on the concept of mentorship. If one of the elements you wish to discuss is the art of listening, how could you best visually represent your idea to your target audience? 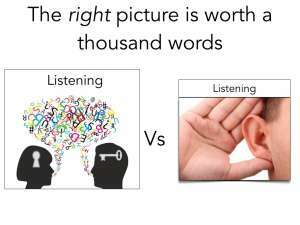 Would the concept of listening be better represented by an ear, a person leaning forward or something else? If you google listening or search a stock photo site (e.g. Shutterstock, 123RF, Dollarphotoclub or iStock) the image you get may look great, but will it represent your idea effectively? Does the image augment your message? Is the idea that you want to share that they should use their ears and listen, or that through listening we gain understanding of another person? If it is understanding, the focus of the slide is on the understanding and something depicting understanding would be more effective though the heading may remain the same. They need to understand that listening forms an integral part of the mentorship programme. They need to “get” that listening is more than repeating the words back to the other person. You want them to listen for meaning and to gain understanding, rather than just to the words. They need a visual prompt that listening is about understanding another person, not just repeating their words. It all comes down to what you are trying to say.